Teeter Inversion Table EP-960 and EP-960 Ltd.
Teeter Hang Ups EP-960 is a very popular inversion table model that is comfortable and easy to use and includes a back pain relief kit. It is also offered as the EP-960 Ltd. Limited Inversion Table which is roughly 36 dollars more at the time of this review, includes Acupressure nodes and lumbar bridge and has longer handles so you can pull yourself up better. Teeter has about three and a half decades of history and focuses on security, quality, and comfort in its range of premium inversion products. The EP960 and EP-960 Ltd. come with a variety of first-class features including an easy reach ankle system with triple lock for your comfort, ankle support dial, pressure reducing foam for a comfy and safe fit. You have the additional options for comfy stretching with the help of very long stretch max handles and traction handles, and an EZ-angle tether with three preset markings at 60, 40 and 20 degrees. It is packed with advanced features and you are guaranteed to get the best price to performance ratio on the market, as a very good quality inversion table that is well different from any tables that cost less than 400 dollars. 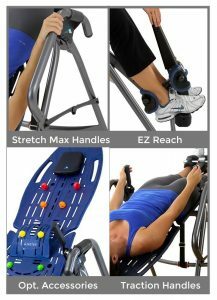 It is very easy to use and you will be in total control with the precision rotation as the inversion table moves your body with your very subtle movements and this is almost effortless and getting back to your starting position is also very easy. As a very durable product, it is built with high-quality components like the heavy-gauge steel, special pivot bearings, cam locks and auto-locking hinges for security. Teeter Inversion Table is shipped unassembled in very good packaging and can be assembled in 5 easy steps in fifteen minutes or so as it comes mostly pre-assembled. Maximum user weight capacity is 300 pounds and people between 4’8” to 6’6” in height, which covers the majority of adults. It can be folded easily for storage (with storage dimensions of 20 x 28.8 x 66 inches) despite being a heavy-duty inversion table. Teeter is a well-known brand for quality and innovation and with a claim to more than 2 million users around the world. There are various tests performed on different inversion tables and Teeter inversion tables beat the competitor models in categories like control of rotation, ease of assembly and durability with higher level components used. You may think the price is a bit high for an inversion unit but when it is a Teeter then it is a completely different story: Teeter inversion tables overdeliver with their ergonomic design, precision rotation system giving you full control and many premium features like acupressure nodes and lumbar bridge, ergo embrace supports, traction handles for oscillation, triple lock security, pre-set rotation, comfortrak bed with hand grips and safe lock-out in full inversion mode. It comes with a User Manual and a DVD but is a good idea to have someone helping you out in your first attempt if you’re new to inversion tables. We can’t really find any negatives about the EP-960 model, other than the price and if you’re not cost-conscious and have more serious and ongoing back problems, then you probably want to pay for something like this model. And if you’re worried about price and have lighter back issues then this may be a little too advanced for your needs. EP-960 Inversion Table is a UL (Underwriter Laboratories) certified product and very safe to use and as a backup of its awesome quality, it is offered with a full warranty for 5 years, which alone is enough to testify how good a brand Teeter is.